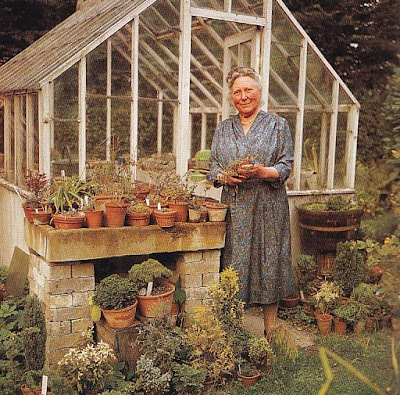 The above picture of Rhoda, Lady Birley, is a favorite of bloggers, as is Lady Birley, who is the perfect English eccentric, making lobster and feeding it to her garden. What many people may not know is the name of the photographer who snapped this image -- Valerie Finnis. Finnis could also fall into the category of English eccentric, all the more reason to love her work. In the rarefied world of “garden photographers”, Valerie Finnis is the exception to the rule. Most photographs feature the sprawling landscape, the individual plant, the over-styled architecture, but Finnis knew in her heart what made a garden – the gardener. Valerie Finnis never liked to take a garden photograph that was devoid of the gardener; one simply couldn’t capture the essence of the garden without them. Because of this, we have great images featuring many famous names in unlikely poses. 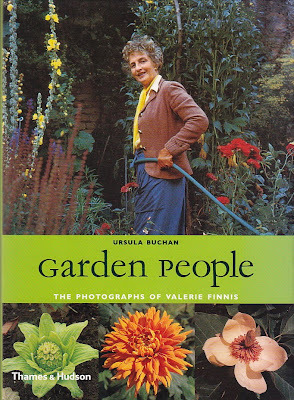 Ursula Buchan assembled a wonderful collection of Finnis' photographs into a book: Garden People: The Photographs of Valerie Finnis. And a glorious book it is; beautifully bound and small enough to hold and fondle without breaking either your arms or the binding. The cover features the inimitably Nancy Lancaster, watering away. 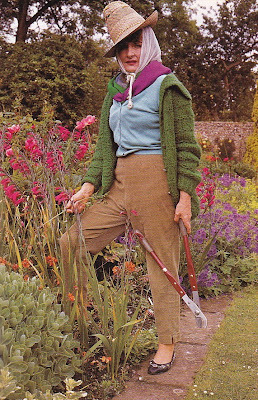 My particular favorite is this photo of Anna Griffith, an expert in alpine plants. 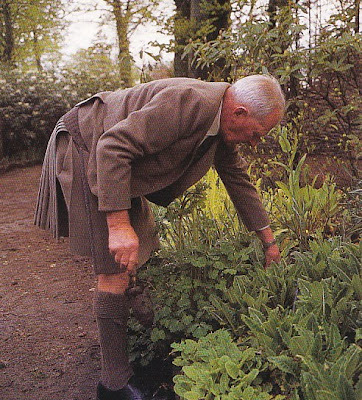 George Sherriff’s mama should have told him watch out when he was gardening in his skirt. (I know it’s a “kilt” and needless to say those Scots are right up there where eccentricities are concerned.) 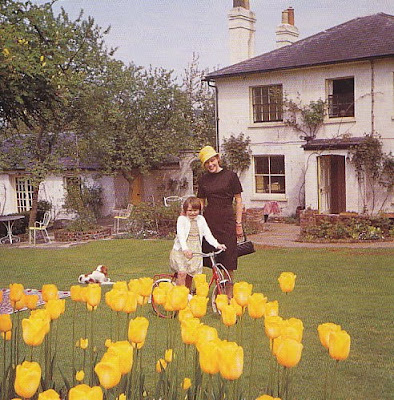 Here are Patricia Neal and her daughter Tessa Dahl in their garden. One a crisp winter day, Finnis had snapped Roald Dahl with their other children. She noted the difference in the garden from season to season and also noted that Neal’s hat exactly matched the tulips. If you don’t have a copy of this little gem, do put it on your Christmas wish list.